Singapore, 19 April 2011 – Race promoter Singapore GP confirmed today the integration of the Singapore Flyer into Zones 1 and 2 of the Marina Bay Street Circuit, allowing Zone 1 and Premier Walkabout ticket-holders complete access to the Singapore Flyer grounds during the 2011 FORMULA 1 SINGTEL SINGAPORE GRAND PRIX. 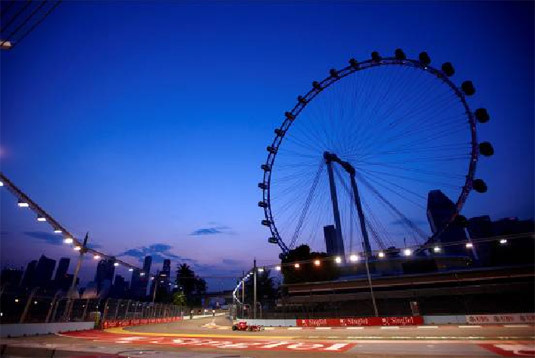 Located between the last two turns (22-23) of the Marina Bay Street Circuit, the Singapore Flyer offers several vantage points of the Pit Building and starting grid, some 165 meters above the track. This is the second time that Singapore GP is partnering Singapore Flyer to allow Pit Straight, Turn 1, Turn 2 and Republic (Turn 3) grandstand and hospitality suite ticketholders as well as Formula One Paddock Club and Premier Walkabout spectators unlimited rides (subject to capacity) on the giant observation wheel. Dedicated express boarding lanes will be catered exclusively for Paddock Club and hospitality suite guests. As an added treat, spectators can view up-close the support race cars lined up at the support paddock within the Singapore Flyer premises and enjoy a myriad of shopping and dining experiences at the Singapore Flyer, including the recently launched Singapore Food Trail, a unique dining concept that evokes the nostalgic feel and charm of the lion city in the 1960s. As part of the integrated layout*, the Double Helix Bridge within Zone 2 offers a panoramic view of the city skyline and selected sections of the track. All Zone 1 and Premier Walkabout ticket-holders will be able to enjoy exclusive access through a gate installed on the 280-meter long pedestrian bridge, linking the Marina Bay Sands Integrated Resort to the Circuit Park. All Zone 1 ticket-holders including Premier Walkabout patrons will also enjoy access to the Padang main entertainment stage within Zone 4 where multi award-winning band Linkin Park will be performing on race day, 25 September 2011. Full details of the complete S$5 million entertainment line-up will be announced in the coming months. Early-bird tickets are now available for sale online (www.singaporegp.sg), via the ticketing hotline +65 6738 6738 as well as all SISTIC outlets.